There are times when you might want to view the Microsoft PowerPoint presentation in the view that you are most comfortable to view with. For example , you might want to have a view with outline tab instead of the Slide tab or there may be scenarios where you rarely use Notes. 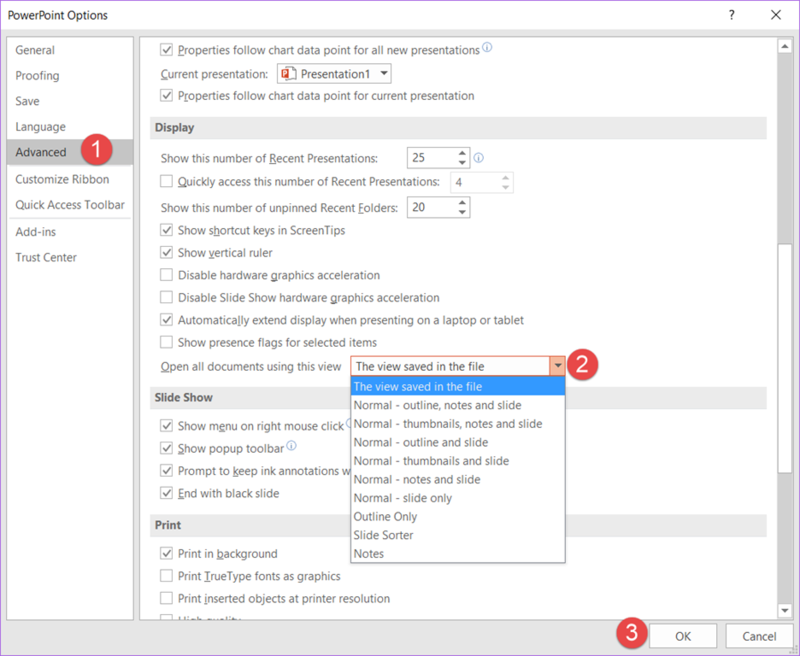 How to change the default view of presentation in Microsoft PowerPoint 2016 ? You can change the default view of your presentation in Microsoft PowerPoint 2016 by following the below steps. 1. Click File and select options. 2. In the PowerPoint Options dialog window , click “Advanced” in the left sidebar and then identify the section display. Select your preferred view from the “Open all documents using this view” dropdownlist and then click OK button. Next time when you open the presentation , you will notice that the view would have changed.